Roslyn Goodstein was born deaf to deaf parents in the Bronx, New York. Her brother Harvey, also born deaf, is Professor Emeritus of Mathematics at Gallaudet University and a well-known leader and advocate in his own right. “My family was deaf, including my brother. We were born ‘signing.’ My parents also read books to us from the beginning, so we achieved bilingual literacy.” Growing up, she loved reading books and comic books. Her schooling was at the rigorously oral Lexington School for the Deaf in Manhattan; she graduated in 1958. She says, “Lexington wasn’t coed past age 7 at that time. Likewise for Fanwood. So when my brother hit 7, he had to transfer to another school. He went for a little while to P.S. 47, then to Fanwood, from where he matriculated. (Lexington had girls only while Fanwood had boys only. Fanwood started admitting girls around 1955 or so. Lexington didn’t have boys older than 7 ‘til they moved from Manhattan to Queens.) Also remember that in those days Speech was King. All believed that if you had it, you’d have a much more wonderful, relevant, blessed life. She met her husband, Herbert Rosen, there. “Herb and I met and fell in love at first sight when I arrived at Gallaudet as a freshman. Three years later (1961) we were married—in the summer before my senior year. Gallaudet College was known as ‘The Happy Hunting Grounds’ in those days, before the women’s rights movement and before deaf female role models existed—my goal was to be a housewife like my mom and Herb’s mom. The world changed and we changed, and life is indeed good.” They have three children—Jeff and Suzy, who became attorneys, and Steve, who became an engineer. Roz and Herb are now the proud grandparents of nine! Dr. Rosen earned her Master’s in Education of Deaf Students from Gallaudet in 1964, and her doctorate in Educational Administration from Catholic University in 1980. She has been involved in teaching, sign-language education, captioning, telecommunications access, ASL advocacy, women’s rights, staunch advocate for human rights and self-determination, parenting issues, leadership—just about everything. She has published and presented extensively. Her first professional position was rehabilitation counselor at the Department of Vocational Rehabilitation in Washington, D.C. (1964-1966). She subsequently held a variety of jobs—including Captioned Films for the Deaf (1967-1976), Sign Communication Instructor for the Department of Education (1973-1975), P.L. 94-142 Coordinator at KDES and MSSD (1977-1978), Director of Kellogg/Gallaudet Special School of the Future (1978-1983), Professor in Gallaudet’s graduate-school Department of Administration and Supervision (1981-2004), Dean of the College for Continuing Education (1981-1993), and Vice President for Academic Affairs, or Provost (1993-1999), Gallaudet’s second-highest position. She was the first female Deaf Dean and first Deaf female provost. She was elected to the NAD Board in 1980 and served as NAD President (1990-1993), Board Member of the World Federation of the Deaf 1995-2003, and was conferred a lifetime honorary Board membership when her term was up. She then served as the International Officer of WFD (2005-2006), and Executive Director of the Council on Education of the Deaf (2000-2006). 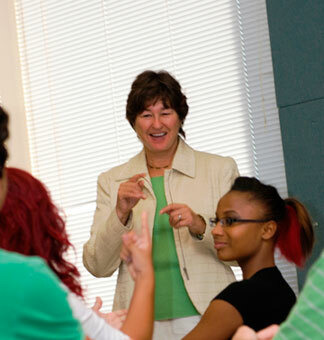 On September 6, 2006, CSUN announced Dr. Rosen’s appointment as Director of NCOD, serving some 200 deaf students. (An estimated 1,000 of CSUN's total enrollment of 36,000 are signers.) She took over from Interim Director Gary Sanderson, who has remained as Special Projects Coordinator. Her responsibilities are manifold; she “directs the daily operation of a comprehensive support-services program, which includes academic advising, student development, direct communication courses, freshman year experience seminars, career planning, student organizations and leadership training, and support services such as interpreting, note taking, and captioning.” She also does fundraising for CSUN and teaches part-time, too.